Most pictures of the International Space Station don’t show much color, we generally see metallic and white elements. The inactive golden colored side of the solar panels – the opposite side of the solar cells – appears to show most of the color over the entire ISS. The active side of the solar panels, where the solar cells are mounted, is actually colorless, almost black. With the naked eye we see sometimes a yellowish-red tint that can be caused by different factors. When the air is reasonably humid or when it contains a high concentration of dust, the color can turn yellow, but it can also have a warmer then usual color when we see the solar panels from a certain angle and the golden color of the panels predominates. Finally, when the ISS is eclipsed by Earth, the moment of reaching the shade can cause a dark red color which is best observable through binoculars. This is the last sunlight reaching the station before the Sun sets; it’s actually the light of an orbital sunset reflecting on the ISS. Telescopic photographs such as the image presented here can show more surprising colors. 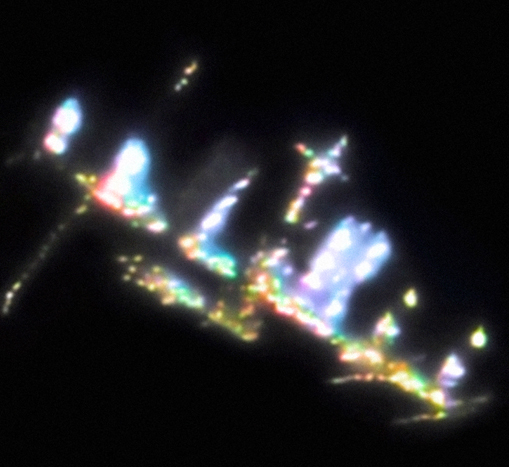 Some metallic surfaces, but especially highly reflective white surfaces such as the radiators of the ISS, often show a (light) blue color in my images of the space station obtained using a 25 centimeter aperture reflecting telescope. 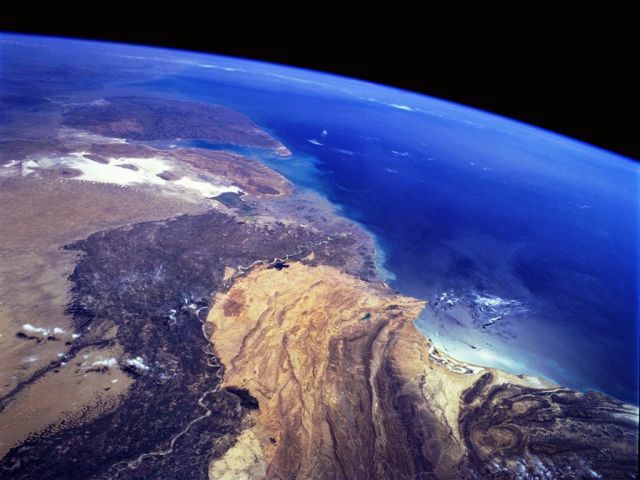 This was especially the case in images during the period around 2008-2009 when I started to capture higher quality video and when the orbit of the ISS was about 60 to 80 kilometers lower than is now the case. 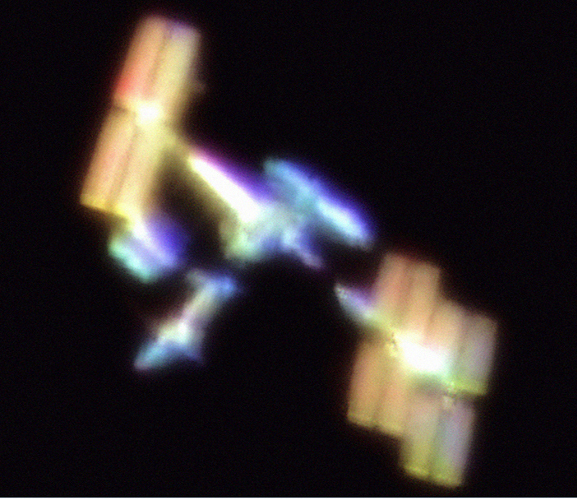 In 2009, I sometimes captured the ISS as it passed at an altitude of around 340 kilometers between boosts by the Progress or the ATV. 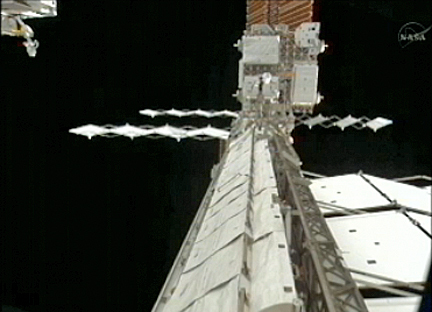 Regular reboosts are needed to overcome the effects of residual atmospheric drag which makes the Station lose about 100 meters in altitude per day. It’s very likely that the lightblue color appearing in the images is reflected Earth light as the color corresponds well with the color of the Earth. In December 2009 there was an extraordinary pass of the ISS when it was at a minimal height of 340 kilometers and it was passing straight overhead. Thanks to these factors, the station could be seen from a rare close distance, enabling me to capture images that were more detailed then usual. When I enhanced color saturation of the images obtained on this session, I couldn’t believe the rich variety of colors that came out. We not only see the blue color of the Earth on the station’s radiators but also other surprising colors like a kind of yellow-green visible on the Columbus laboratory and several different colors along the integrated truss structure and other places. If we look closely at the image, we see that certain colors are kept within the border of a certain element or module. For example you see that the tip of both the S-3 and S-6 radiators visible at the right side in the image have a yellow-green color as well, while their underside shows another color. All these differences in reflection can be in some way explained by the direction an element is pointing and at which angle it is reflecting the light to the observer. THe ISS is another boon doggle project like the Space Chuttle was. It should be scapped and the money spent to colonize Mars. To learn how Russia has hoodwinked the USA for years…read..” Star Crossed Orbits” to learn about all the Russian double crosses to the USA. The Space Shuttle was over priced and under achieving and so is the ISS. If we are ever to get off this planet, before we drown in our own polution…we need FREE ENTERPRISE like SpaceX and Virgin Galactic. Elon Musk of Spacex knows how to do a technical challenge competitently and profitably….HE did : Paypal, Spacex, Tesla Motors, all in the black. Nasa does everything in the red..Space Shuttle and now ISS….